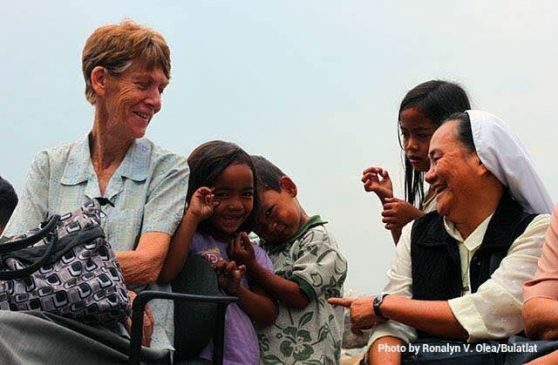 MANILA — An Australian missionary who has long been active in supporting Filipino farmers and defending human rights in the Philippines was arrested by elements of the Bureau of Immigration (BI) at around 2:30 p.m. today, April 16. According to human rights alliance Karapatan, six intelligence officers of the BI went to Sr. Patricia Fox’s house in Project 3, Quezon City. The BI agents “invited” her for random checking and verification of her immigration papers and status. They hurriedly showed her an “invitation/mission order” but they did not give her a copy. Fox asked the agents if she can go to the BI office the next day,but they told her that she should go with them now and that she was not allowed to defer her “visit” to the BI office. Sensing that she had no choice, she went with the BI agents, accompanied by a fellow nun from her congregation. When they arrived at the BI office in Intramuros, Manila at 4 p.m. today, the BI agents read to Fox her rights as a detainee but did not show any document indicating charges. Her captors, though, have been saying that she is being arrested for joining rallies and “illegal political activities.” Fox was told she would be detained overnight and would be deported tomorrow. As of this writing, inquest proceedings against Fox are ongoing. Karapatan noted that Fox is deprived of her right to due process, to information on why she is being arrested and to direct access to human rights organizations and legal counsels. Fox, 71, recently joined the International Fact Finding and Solidarity Mission (IFFSM) in Southern Mindanao region to probe the killings and human rights violations against farmers. Last February, she also joined another international solidarity mission on the situation of Lumad and indigenous people of Mindanao. Cristina Palabay, secretary general of Karapatan, said Fox should be immediately released and her deportation should be vigorously opposed. “It is an irony that the Duterte regime and those who are threatening Fox’s deportation are the very people who have made the country a living hell for its citizens, while foreign missionaries and rights advocates like Fox have long been working side by side with the poor and oppressed to improve their deplorable conditions,” Palabay said. – In February 2018, five foreign members of an international solidarity mission were also held by the BI. The International Coalition for Human Rights in the Philippines and the Mindanaoans for Civil Liberties spearheaded the said mission to investigate reports of human rights violations in Mindanao linked to the implementation of martial law and counterinsurgency program Oplan Kapayapaan. – Last April 15, Italian citizen Giacomo Filibeck, deputy secretary general of the Party of European Socialists, was barred from entering the Philippines and was immediately deported by BI officials from the Mactan-Cebu International Airport. Filibeck was part of an international human rights mission in October 2017 in the Philippines that looked into cases of human rights violations. – In a speech last April 13, President Rodrigo Duterte warned Prosecutor Fatou Bensouda of the International Criminal Court that she will be barred from entering the country and will face arrest as the ICC pursues its investigation on Duterte’s accountability in the extrajudicial killings in line with the drug war. “The Duterte regime’s contempt for any and all forms of investigation, including that of international human rights observers and development workers, into its record of human rights violations betrays its guilt,” Palabay said. In a separate statement, the Makabayan bloc in Congress also condemned the arrest of Fox and called for her immediate release. “The immigration department is barking in a wrong tree on this one. Sis. Pat Fox had a good standing status both in Australia and in the Philippines. Helping the poor is not a crime and joining peace activities to advocate for peasant welfare and human rights is not against the law,” the legislators said.